DOUGHERTY CO., GA (WALB) - The aftermath of Hurricane Michael has ruined cars and homes and many other places, making the cleanup challenging. Safety is key for how and where you place your storm debris. The city wants to remind people when sorting through debris it is best to separate. There’s tree and vegetation debris, household furniture, construction debris, and appliances all should be separated so crews do not have to sort through this. When moving different debris, make sure you do not put it in the street. Keep it on your front lawn. If you put it in the street it can become a driving and walking hazard. 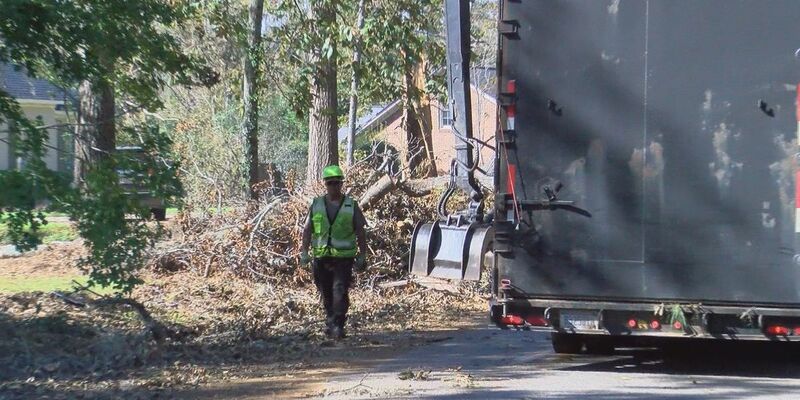 As crews are making their way through town you want to make sure your piles of debris are manageable for pickup. That may require some work on your end by chopping trees into sections. Do not place whole trees out for removal. For many people, they can't complete the cleanup alone. But when you’re looking for a contractor they must have a business license issued by the county treasury. Structural, HVAC, plumbing, and electrical contractors must hold a state certification and local occupational tax certificate or OTC. Contractors performing structural repairs must obtain a building permit. And if you're paying someone to dispose of the debris it cannot be placed in the street or road. It must be separated and disposed properly. Finally, contractors have to comply with all local, state and federal laws. Again, this is just to ensure you are not getting scammed and receiving the help you need and are paying for. If you need help or wish to do volunteer work you can contact the Dougherty County Emergency Operations Center at 229-483-6226 or 229-483-6227.